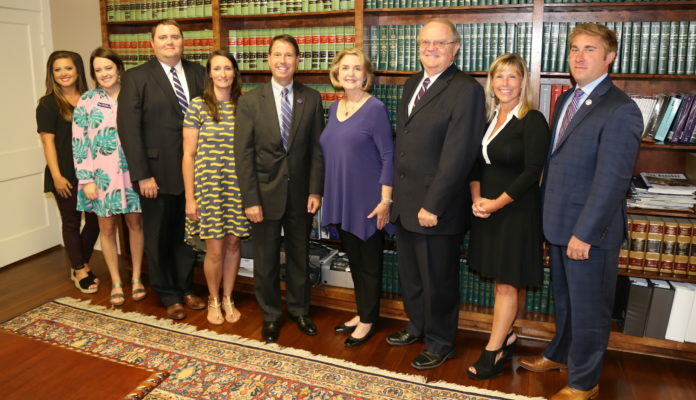 The Dunahoe Law Firm is a Presidential Host of the community reception that will honor Dr. Chris Maggio and his family following his investiture as president of Northwestern State University Friday. The day will include a 9 a.m. Mass of Thanksgiving at Immaculate Conception, 11 a.m. formal investiture ceremony and the community reception for all friends of NSU that will follow from 12:30-2:30 p.m. at the President’s Residence. The reception will include refreshments and will showcase the talents of students in NSU’s School of Creative and Performing Arts. From left are NSU Development Officers Rebekah Burleson and Brittany McNeely, Jared and Danielle Dunahoe, Dr. Chris Maggio, Lola and Edwin Dunahoe, Jill Bankston, CFRE, and Drake Owens, director of the NSU Foundation.